As you may have noticed the Millstreet Tidy Town Association Volunteers have been quite busy over the last number of weeks. Almost all of the planters and tubs have been set with beautiful flowers over the last number of weeks. Please see pictures in the 2016 gallery for some pictures of the very hard work achieved. Just a reminder to everybody that is living/working near one of the tubs or planters, please, please can you water them. They will need to be watered 3 times a week even if it rains. 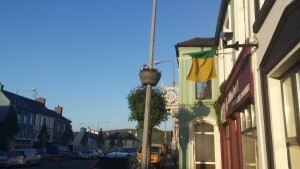 The flowers for the poles will be out up very soon. 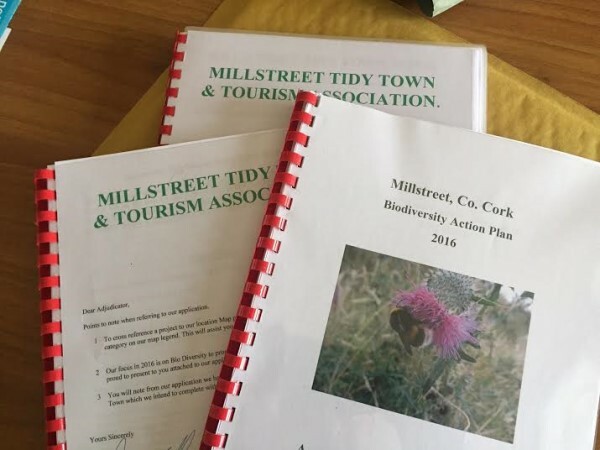 After many long evenings, drafts and redrafts the final application form for Supervalu National Tidy Town competition is ready for submission. A huge thanks to all involved in getting this application ready for the judges. It definitely is a group effort. Lets hope we can better the results from last year. 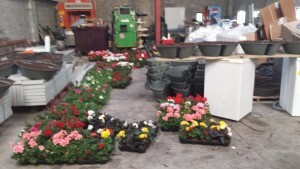 From Flowers waiting to be planted to a beautiful display to don our main street. There was a flurry of activity in The Square this evening. Is it a bird? Is it a plane? No, it was Patrick Hickey and his merry band of men (all whom declined to be pictured). 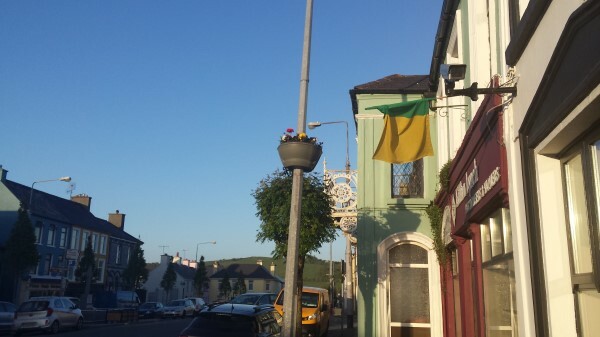 These men were out in a most beautiful May evening putting up the new Flower Baskets for the main street. They look wonderful. The flower baskets stretch from The Church right up the very top of The Square. They are a welcome addition to this years crop of flowers that are springing up everywhere in the last two weeks or so. Everyone is getting fairly busy now. More photographs can be seen in 2015 Gallery. Please do send on any photographs that you may have. Well done lads. 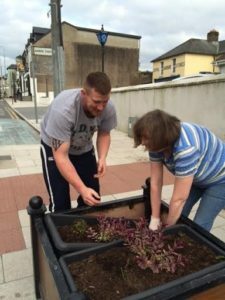 Pat and Noreen and their wonderful team of volunteers have been planting beds all over Millstreet in the last couple of weeks. Pictured are the flower beds at Drishane Castle and they look beautiful. It is a magnificent sight to see entering and leaving the town. The beds have also been done on Macroom Road, Killarney Road, various pots in town as well as The Square. More pictures can be seen in 2015 gallery. Well done to all involved. Help is always needed, so please feel free to contact us here if you would like to help. Millstreet Tidy Town Association are delighted to announce that once again this year there will be an award for Best Frontage Competition 2015. There will be two categories this year. Best Commercial Premises and Best Residential Area. The Best Residential Area, can be an estate, a street or a road. Adjudication will commence in June and run through to the end of August. So why not get together with your neighbours and win it for your residential area. Everybody can do a small part and make a big impact.